The ProtoDUNE detectors for the Deep Underground Neutrino Experiment are behemoths in their own right. In one sense, the two ProtoDUNE detectors are small. As prototypes of the much larger planned Deep Underground Neutrino Experiment, they are only representative slices, each measuring about 1 percent of the size of the final detector. But in all other ways, the ProtoDUNE detectors are simply massive. Once they are complete later this year, these two test detectors will be larger than any detector ever built that uses liquid argon, its active material. The international project involves dozens of experimental groups coordinating around the world. And most critically, the ProtoDUNE detectors, which are being installed and tested at the European particle physics laboratory CERN, are the rehearsal spaces in which physicists, engineers and technicians will hammer out nearly every engineering problem confronting DUNE, the biggest international science project ever conducted in the United States. It is hosted by the Department of Energy’s Fermi National Accelerator Laboratory. DUNE’s mission, when it comes online in the mid-2020s, will be to pin down the nature of the neutrino, the most ubiquitous particle of matter in the universe. Despite neutrinos’ omnipresence—they fill the universe, and trillions of them stream through us every second—they are a pain in the neck to capture. Neutrinos are vanishingly small, fleeting particles that, unlike other members of the subatomic realm, are heedless of the matter through which they fly, never stopping to interact. Once in a while, scientists can catch one. And when they do, it might tell them a bit about the origins of the universe and why matter predominates over antimatter—and thus how we came to be here at all. A global community of more than 1000 scientists from 31 countries are building DUNE, a megascience experiment hosted at Fermilab. The researchers’ plan is to observe neutrinos using two detectors separated by 1300 kilometers—one at Fermilab outside Chicago and a second one a mile underground in South Dakota at the Sanford Underground Research Facility. Having one at each end enables scientists to see how neutrinos transform as they travel over a long distance. The DUNE collaboration is going all-in on the bigger-is-better strategy; after all, the bigger the detector, the more likely scientists are to snag a neutrino. The detector located in South Dakota, called the DUNE far detector, will hold 70,000 metric tons (equivalent to about 525,000 bathtubs) of liquid argon to serve as the neutrino fishing net. It comprises four large modules. Each will stand four stories high and, not including the structures that house the utilities, occupy a footprint roughly equal to a soccer field. In short, DUNE is giant. The ProtoDUNE detectors are small only when compared to the giant DUNE detector. If each of the four DUNE modules is a 20-room building, then each ProtoDUNE detector is one room. But one room large enough to envelop a small house. As one repeatable unit of the ultimate detector, the ProtoDUNE detectors are necessarily big. Each is an enormous cube—about two stories high and about as wide—and contains about 800 metric tons of liquid argon. Why two prototypes? Researchers are investigating two ways to use argon and so are constructing two slightly different but equally sized test beds. The single-phase ProtoDUNE uses only liquid argon, while the dual-phase ProtoDUNE uses argon as both a liquid and a gas. “They’re the largest liquid-argon particle detectors that have ever been built,” says Ed Blucher, DUNE co-spokesperson and a physicist at the University of Chicago. As DUNE’s test bed, the ProtoDUNE detectors also have to offer researchers a realistic picture of how the liquid-argon detection technology will work in DUNE, so the instrumentation inside the detectors is also at full, giant scale. A crucial step for ProtoDUNE was welding together the cryostat, or cold vessel, that will house the detector components and liquid argon. ProtoDUNE is a rehearsal for DUNE not only in its technical orchestration but also in the coordination of human activity. When scientists were planning their next-generation neutrino experiment around 2013, they realized that it could succeed only by bringing the international scientific community together to build the project. They also saw that even the prototyping would require an effort of global proportions—both geographically and professionally. As a result, DUNE and ProtoDUNE actively invite students, early-career scientists and senior researchers from all around the world to contribute. “The scale of ProtoDUNE, a global collaboration at CERN for a US-based megaproject, is a paradigm change in the way neutrino science is done,” says Christos Touramanis, a physicist at the University of Liverpool and one of the co-coordinators of the single-phase detector. For both DUNE and ProtoDUNE, funding comes from partners around the world, including the Department of Energy's Office of Science and CERN. The successful execution of ProtoDUNE’s assembly and testing by international groups requires a unity of purpose from parties that could hardly be farther apart, geographically speaking. Scientists say the effort is going smoothly. The anode plane array (APA) is prepped for shipment at Daresbury Laboratory in the UK. So how do neutrino liquid-argon detectors work? Most of the space inside serves as the arena of particle interaction, where neutrinos can smash into an argon atom and create secondary particles. Surrounding this interaction space is the instrumentation that records these rare collisions, like a camera committing the scene to film. DUNE collaborators are developing and constructing the recording instruments that will capture the evidence of these interactions. One signal is ionization charge: A neutrino interaction generates other particles that propagate through the detector’s vast argon pool, kicking electrons—called ionization electrons—off atoms as they go. The second signal is light. The first signal emerges as a streak of ionization electrons. To record the signal, scientists will use something called an anode plane array, or APA. An APA is a screen created using 24 kilometers of precisely tensioned, closely spaced, continuously wound wire. This wire screen is positively charged, so it attracts the negatively charged electrons. Much the way a wave front approaches the beach’s shore, the particle track—a string of the ionization electrons—will head toward the positively charged wires inside the ProtoDUNE detectors. The wires will send information about the track to computers, which will record its properties and thus information about the original neutrino interaction. A group in the University of Wisconsin–Madison Physical Sciences Lab led by Paulos designed the single-phase ProtoDUNE wire arrays. 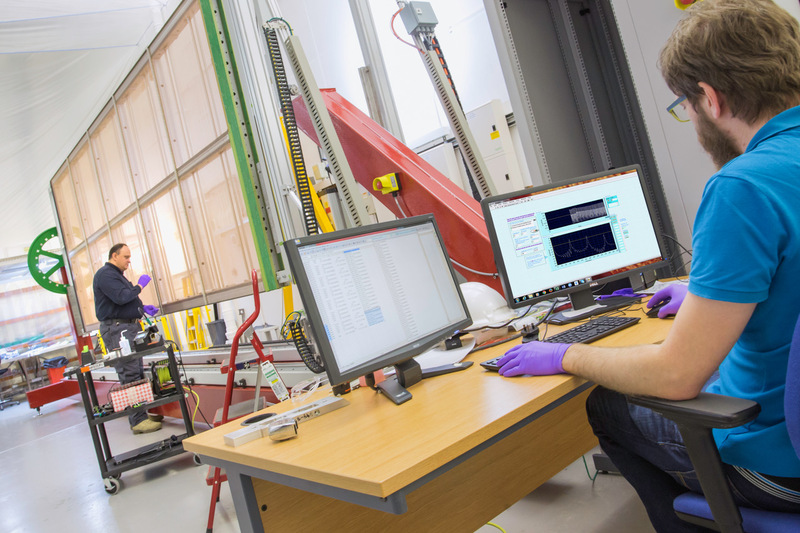 The Wisconsin group, the Science and Technology Facilities Council’s Daresbury Laboratory in the UK and several UK universities are building APAs for the same detector. The first APA from Wisconsin arrived at CERN last year; the first from Daresbury Lab arrived earlier this week. The anode planes attract the electrons. Pushing away the electrons will be a complementary set of panels, called the cathode plane. Together, the anode and cathode planes behave like battery terminals, with one repelling electron tracks and the other drawing them in. A group at CERN designed and is building the cathode plane. The dual-phase detector will operate on the same principle but with a different configuration of wire arrays. A special layer of electronics near the cathode will allow for the amplification of faint electron tracks in a layer of gaseous argon. Groups at institutions in France, Germany and Switzerland are designing those instruments. Once complete, they will also send their arrays to be tested at CERN. Then there’s the business of observing light. The flash of light is the result of a release of energy from the electron in the process of getting bumped from an argon atom. The appearance of light is like the signal to start a stopwatch; it marks the moment the neutrino interaction in a detector takes place. This enables scientists to reconstruct in three dimensions the picture of the interaction and resulting particles. On the other side of the equator, a group at the University of Campinas in Brazil is coordinating the installation of instruments that will capture the flashes of light resulting from particle interactions in the single-phase ProtoDUNE detector. Two of the designs for the single-phase prototype—one by Indiana University, the other by Fermilab and MIT—are of a type called guiding bars. These long, narrow strips work like fiber optic cables: they capture the light, convert it into light in the visible spectrum and finally guide it to an external sensor. A third design, called ARAPUCA, was developed by three Brazilian universities and Fermilab and is being partially produced at Colorado State University. Named for the Guaraní word for a bird trap, the efficient ARAPUCA design will be able to “trap” even very low light signals and transmit them to its sensors. Groups from France, Spain and the Swiss Federal Institute of Technology are developing the light detection system for the dual-phase prototype, which will comprise 36 photomultiplier tubes, or PMTs, situated near the cathode plane. A PMT works by picking up the light from the particle interaction and converting it into electrons, multiplying their number and so amplifying the signal’s strength as the electrons travel down the tube. With two tricked-out detectors, the DUNE collaboration can test their picture-taking capabilities and prepare DUNE to capture in exquisite detail the fleeting interactions of neutrinos. The ARAPUCA array, designed by three Brazilian universities and Fermilab, was partially produced at Colorado State University. But even if they’re instrumented to the nines inside, two isolated prototypes do not a proper test bed make. Both ProtoDUNE detectors must be hooked up to computing systems so particle interaction signals can be converted into data. Each detector must be contained in a cryostat, which functions like a thermos, for the argon to be cold enough to maintain a liquid state. And the detectors must be fed particles in the first place. CERN is addressing these key areas by providing particle beam, innovative cryogenics and computing infrastructures, and connecting the prototype detectors with the DUNE experimental environment. DUNE’s neutrinos will be provided by the Long-Baseline Neutrino Facility, or LBNF, which held an underground groundbreaking for the start of its construction in July. LBNF, led by Fermilab, will provide the construction, beamline and cryogenics for the mammoth DUNE detector, as well as Fermilab’s chain of particle accelerators, which will provide the world’s most intense neutrino beam to the experiment. CERN is helping simulate that environment as closely as possible with the scaled-down ProtoDUNE detectors, furnishing them with particle beams so researchers can characterize how the detectors respond. 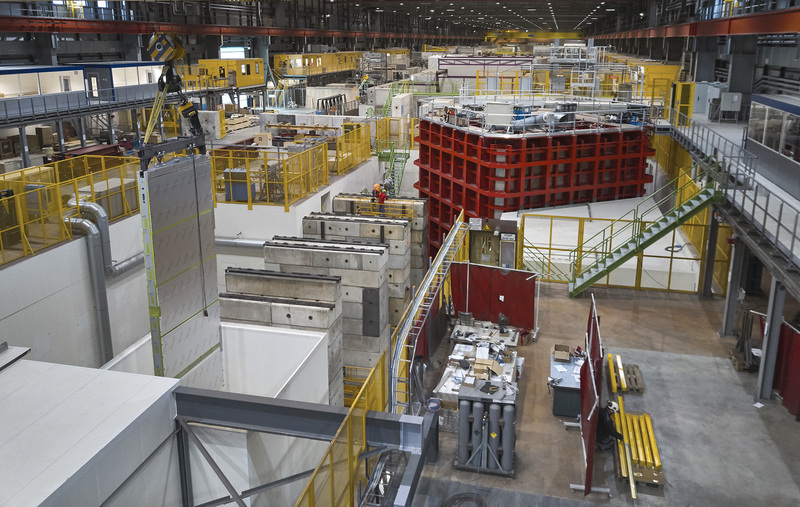 Under the leadership of scientist Marzio Nessi, last year the CERN group built a new facility for the test beds, where CERN is now constructing two new particle beamlines that extend the lab’s existing network. In addition, CERN built the ProtoDUNE cryostats—the largest ever constructed for a particle physics experiment—which also will serve as prototypes for those used in DUNE. Scientists will be able to gather and interpret the data generated from the detectors with a CERN computing farm and software and hardware from several UK universities. 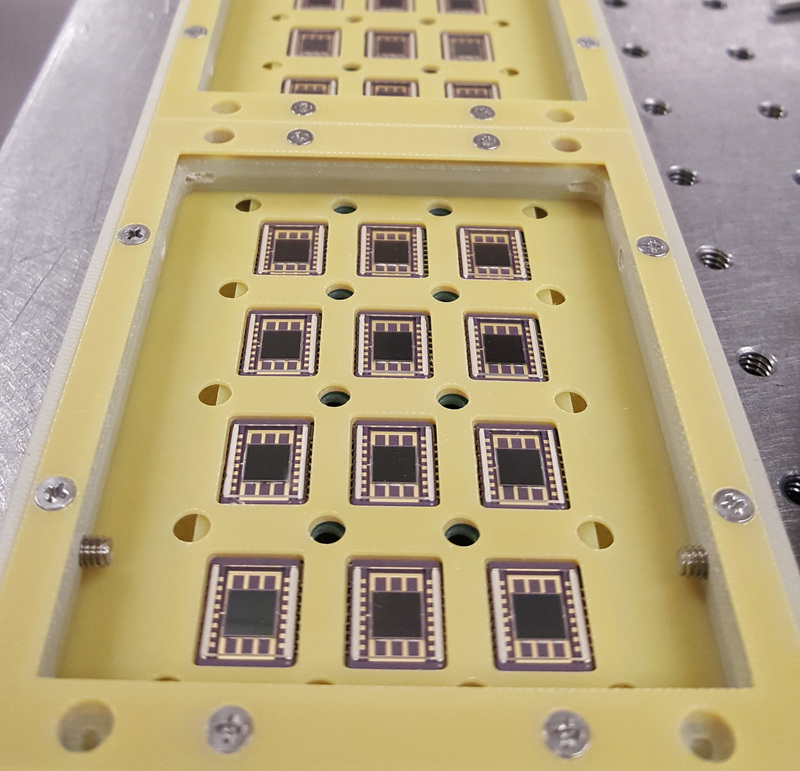 “The very process of building these prototype detectors provides a stress test for building them in DUNE,” Blucher says. CERN’s beam schedule sets the schedule for testing. In December, the European laboratory will temporarily shut off beam to its experiments for upgrades to the Large Hadron Collider. 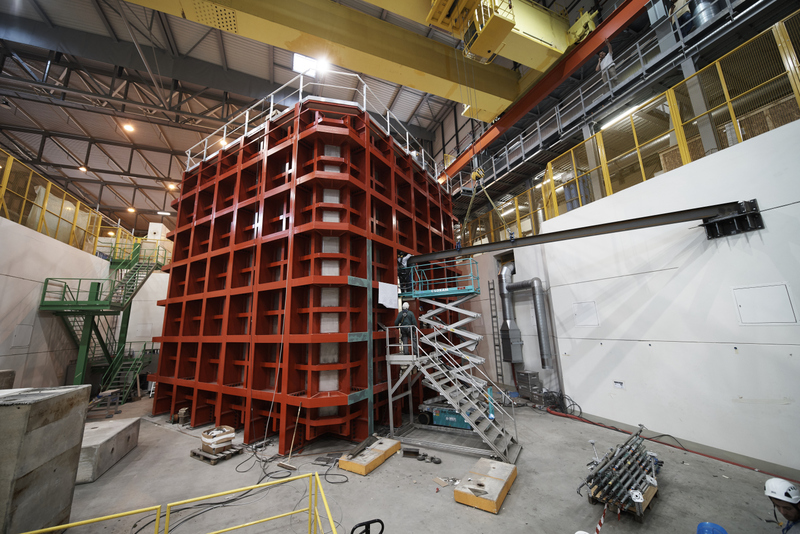 DUNE scientists aim to position the ProtoDUNE detectors in the CERN beam before then, testing the new technologies pioneered as part of the experiment. The recently arrived anode plane array (hanging on the left) is moved by a crane to its new home in the ProtoDUNE cryostat. After a rush to start up the first large prototype detector, stellar results show the technology for the Deep Underground Neutrino Experiment is ready to shine. International collaborators are delivering parts to be used in Fermilab's Short-Baseline Neutrino program. We already know neutrinos break the mold of the Standard Model. The question is: By how much? CERN and Fermilab announce a big step forward for the Deep Underground Neutrino Experiment. This instrument developed for DUNE can take 48 temperatures simultaneously and with expert precision. With this move, ICARUS now sits in the path of Fermilab's neutrino beam, a milestone that brings the detector one step closer to taking data.